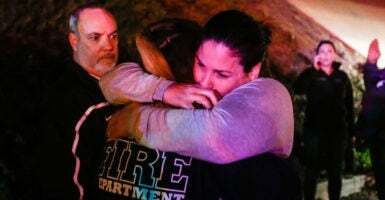 Multiple men reportedly put their bodies on the line to protect patrons at the club in California where a gunman entered Wednesday night, killing 12 and reportedly taking his own life. The gunman entered Borderline Bar and Grill in Thousand Oaks Wednesday night around 11:20 p.m. and opened fire at a crowd of mostly college students using a semi-automatic pistol. It was “country night” at the bar. The suspect is identified as 28-year-old David Ian Long, who reportedly dressed in a black hooded sweatshirt. The gunman and Ventura County Sheriff’s Deputy Ron Helus is among the dead, according to NBC News. Hundreds of people attended a procession for Helus Thursday. Eighteen other victims were injured while trying to escape from the club during the shooting. They are being treated at local hospitals, according to Ventura County Fire Department Capt. Stan Ziegler.